Type II Hei, flown by a Warrant Officer Kazuki Kobayashi of the 1st Chutai, 23rd Sentai, from the Inaba Air Base in China in the November of 1945. The aircraft is painted in a dark green on its upper surfaces over light grey undersides It sports a red/brown spinner and a black anti-glare panel fore and aft the cockpit on the upper fuselage and engine cowling (as do all of the options on the sheet). 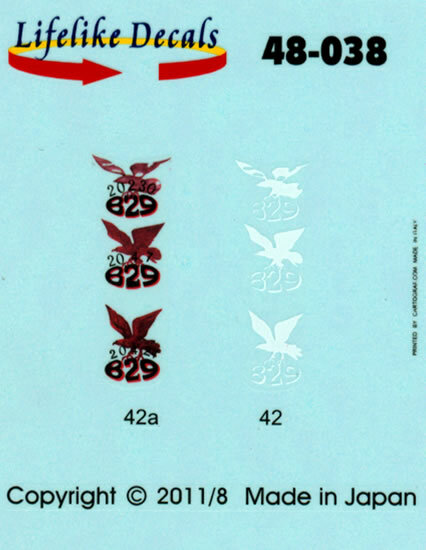 The leading edges of the wings are in yellow, again, as are all of the options on the sheet and this latter marking is supplied as a multi-part decal. A great option for those of us scared of natural metal finishes! Type II Kou, belonging to the 2nd Chutai, of the 85th Sentai at the Kwantung Air Base, China in 1944. The placement guide advises that it is in natural metal finish with blotches of either dark green or sand brown on it upper surfaces and unusually, on its main gear covers. It has a red/brown spinner and a black anti-glare panel fore and aft the cockpit on the upper fuselage and engine cowling a well as the leading edges of its wings in yellow. A challenging finish for those brave enough to attempt it! Type II Hei, flown by Major Tohgo Saito, the Commander of the 85th Sentai when irt was at the Kwantung Air Base, China in the summer of 1944. It is in overall natural metal finish with a coat of peeling dark green paint on its upper surfaces. Black anti-glare, a blue spinner and yellow leading edges to the wings. 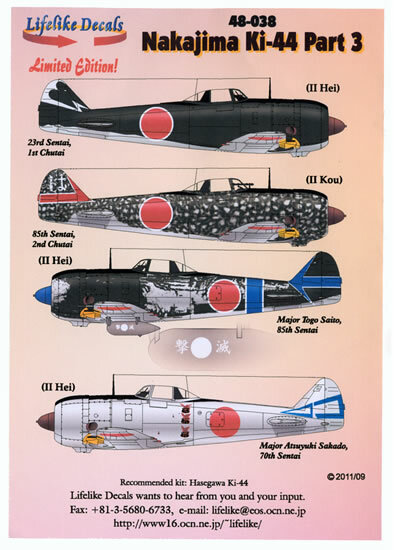 Type II Hei flown by Major Atsuyuki Sakado, the 70th Sentai commander at Kashiwa Air Base, China circa June 1945. In overall natural metal finish with a red/brown spinner, black anti-glare panels on the upper surfaces and yellow leading edges to the wings. It wears three victory markings on the port side of the fuselage to the rear of the cockpit. The decals themselves have been printed by Cartograf. They are very glossy and have a minimum of carrier film surrounding each subject. 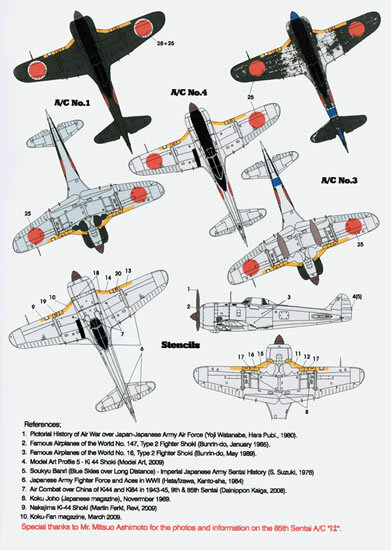 Two sets of (minimal) stencil data is provided as are two separate sets of hinomarus which will enable you to realise two models from the sheet should you paint the wings yellow leading edges of the second model. 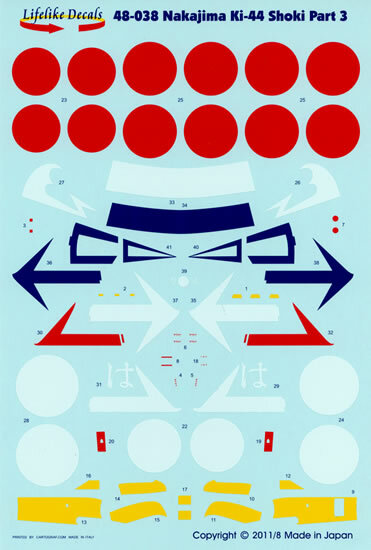 There are two sheets with this one, a large one carrying most of the markings and a smaller one that carries the victory markings of the forth option. The placement guide comes in the form of two heavy-weight paper A-4 sized sheets. Left hand side profiles are provided for each option as well as (smaller upper and lower plan surface views. As mentioned above, very comprehensive notes are provided for each option and why a particular marking was chosen over another is carefully explained when there is doubt between the various references used in realising the sheet. 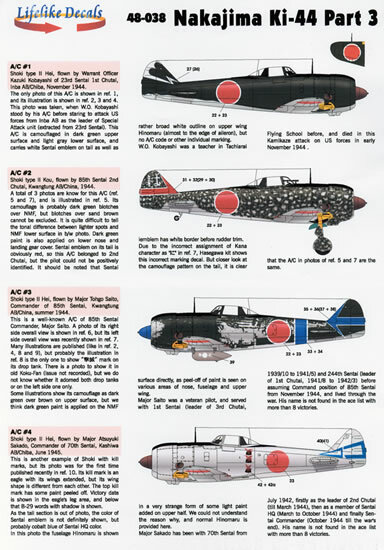 The guide also lists 10 different references for the research in producing the decals. The placement guides and the two decal sheets come packed in a clear plastic zip-loc bag.